The latest release of CDC’s Morbidity and Mortality Weekly Report (MMWR) highlights the rapidly expanding program to routinely test all newborns for critical congenital heart disease (CCHD). In September 2011, CCHD was added to the HHS secretary’s Recommended Uniform Screening Panel (RUSP) for all newborns in the United States. Currently, the vast majority of states require CCHD screening for newborns while others have policies in the pipeline. As noted in the MMWR, in 2014 CDC began partnering with the Newborn Screening Technical assistance and Evaluation Program (NewSTEPs), a program of APHL in collaboration with the Colorado School of Public Health. NewSTEPs is a national newborn screening program designed to provide data, technical assistance and training to state newborn screening programs across the country. Sikha Singh, manager of NewSTEPs (APHL), and Marci Sontag, associate director of NewSTEPs (Colorado School of Public Health), answered some questions about bringing routine CCHD screening to all 50 states. A primary role for NewSTEPs in the success of the CCHD newborn screening program has been data collection. Why is data collection a key contributor to this program’s success? – How many newborns were screened? – Were there any newborns who were not screened but should have been? – How many newborns had abnormal screening results and what happened to them? – Did the newborns who had abnormal results receive the appropriate follow-up and care? – Is the testing algorithm being appropriately implemented? – Can changes be made to the algorithm to decrease inaccurate results? CCHD newborn screening is done right in the hospital with a pulse-oximeter that is placed on the baby’s foot. No sample is sent to a public health laboratory like with other newborn screening tests. So why is APHL involved in this aspect of the newborn screening program? 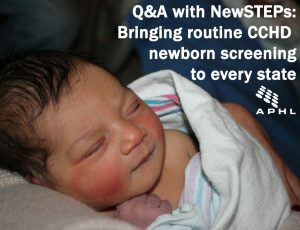 APHL and NewSTEPs are a newborn screening resource, so we are responsible for supporting that system. CCHD screening is one of two point-of-care newborn screening tests that are not laboratory- based (hearing loss detection is the other.) In many cases, newborn screening program staff are covering all aspects of the state’s newborn screening program. If our members and partners are focused on the entire system, we need to be as well. Why was the addition of CCHD testing so significant for the newborn screening program? Addressing CCHD screenings is very different from other newborn screens because abnormal results mean a baby requires immediate follow-up care prior to leaving the hospital. Abnormal results would indicate a dire situation and, in many cases, the solution is open heart surgery. CCHD screening therefore sets off a completely different chain of events than other newborn screens. From the direct perspective of NewSTEPs, the exchange of information is different. 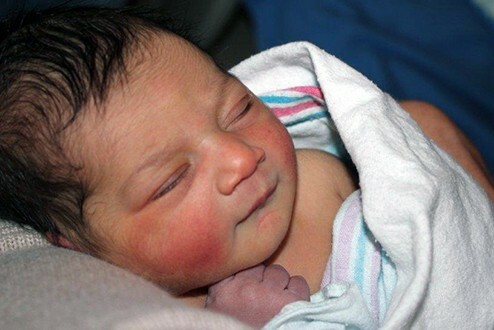 With laboratory- based newborn screening, data is typically sent from the state public health laboratories to birthing facilities. With CCHD, we are working to get data from birthing facilities to newborn screening programs, which poses significant financial and logistical challenges. More broadly speaking, the addition of CCHD to newborn screening panels has expanded public health’s commitment to addressing severe conditions in the very early stages of life before permanent damage can be done. While newborn screening once referred only to metabolic conditions, it now includes many other types of heritable diseases as well. The addition of both CCHD and hearing loss detection brought newborn screening into completely new territories but under the same goal of saving and improving babies’ lives. What needs to happen to have all 50 states routinely screening every newborn for CCHD? As the MMWR indicates, we are very close to having all states routinely screening for CCHD. In fact, additional states have begun mandatory CCHD screenings since the MMWR was written. NewSTEPs works closely with each state to evaluate the best mechanism for moving routine CCHD screening forward. In some states, legislative action has been necessary to move CCHD screening forward, but other states have mandated screening through regulatory action, and yet other states have implemented statewide screening absent a legislative or regulatory mandate. Through our ongoing data collection and analysis, along with the help of partner organizations and parent advocates, we have the tools and the momentum necessary to ensure that CCHD newborn screening becomes the standard of care in all states.